Tassimo Mixed Variety Packed Tassimo comes up with an ideal packaging; you can say three scrumptious beverages in one pack. Signature Blend, French Vanilla, and Morning Roast Coffee are one of the favorite and most incredible beverages among all coffee packs. Single serving of each of them contains different calories. An ideal and truly aromatic family box. Alluring, Lip licking Aromatic Coffees Let your Tassimo brewer brew up a truly delicious latte. 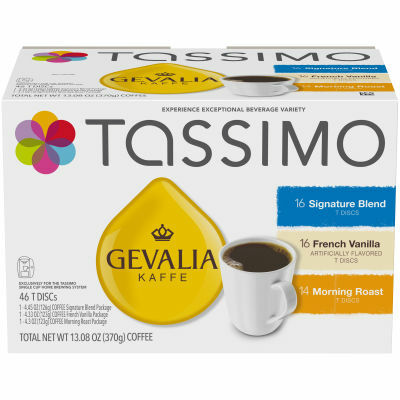 Gently roasted Gevalia offers a beautiful blend of Arabica beans creates a smooth and caramelized and alluring aroma with the combination of real milk creamer, delivering the satisfying smoothness you desire.